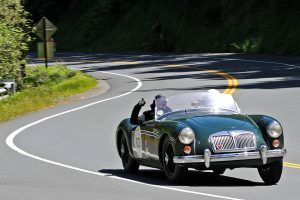 Via Corsa Magazine Takes You on the Adventure of a Lifetime! From Car Lover’s Guidebooks to a nationally published magazine, Via Corsa is the publication for automotive enthusiasts, written by automotive enthusiasts. This is the Sports Car Adventure Magazine that will be out at the nearest or farthest reaching event or rally, experiencing adventures firsthand and then writing about the experience in a first-person and human perspective to put the reader in the adventures themselves. The sports car is not necessarily the focus, but rather the scope of the sports car culture as a whole. Via Corsa Magazine will be the publication that puts the reader in the passenger seat as we take you on adventures with people, places, events… and drives. Strap in and let’s drive the adventure together! Visit our shop to order Via Corsa products and apparel. Be on the lookout for Via Corsa’s mail order catalogue, Via Corsa 360, bringing an immersive integrated product and storytelling experience right to your fingertips!